Remote, Live Broadcast, or Tech Fun? I should start by saying it has been way too long since a post. Truth be told, it has not been the most exciting, eventful few months for me in the biz. A lot of little things, but nothing to write home about! OK, that was pretty bad. There is one area that received some attention and that was remote broadcast delivery and call ins. 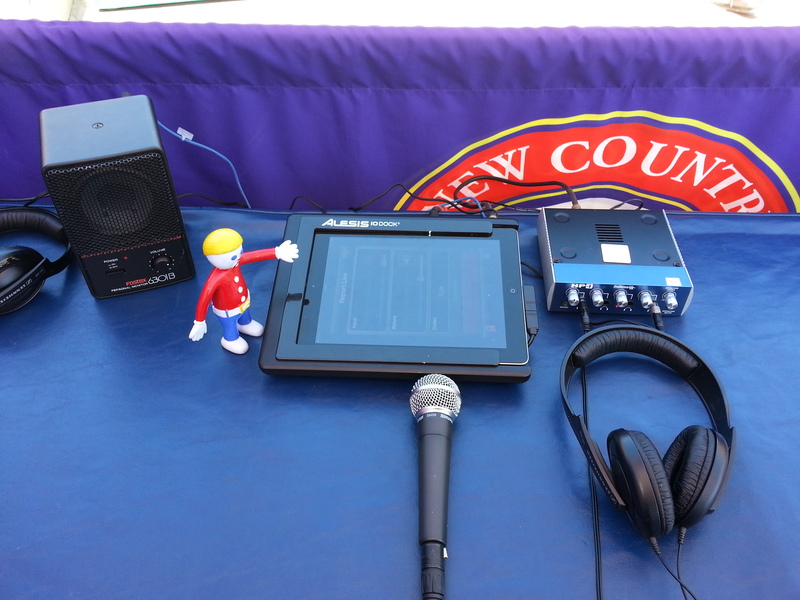 The main equipment are iPads with built-in wireless 4G and docks along with the Tieline Report-IT app. We deployed three new road cases, each with its own challenge. As posted in July, the first case built utilized the Alesis I/O Dock. Designed, or should I say intended, to be used as a personal I/O (input/output) device for the home recording artist using an iPad. After setup and testing we discovered that the inputs, mic and mic/guitar, were channel independent, i.e. one fed the left channel, the other the right channel. This is all fine and well if recording on the iPad, but the Report-IT app only recognized the left channel. Not a big surprise as it was designed to accept a single input, a microphone, which is a mono source. In development I bet no one said, “No “blank” is going to need anything else.” To correct this issue, I modified the Alesis, oh no warranty busted, such that the second channel fed the first channel right before the A/D converter that feeds the iPad. Problem solved and it did not affect the headphone or monitoring feeds. With the success of number one, the search continued for other alternatives within reason, or lack of budget. Lo and behold the discovery of the Behringer iStudio iPad dock. This puppy is less expensive that the Alesis, so what do we have to lose, or gain? Testing it out I discovered the same problem as the Alesis, only one channel fed the Report-IT app. Indeed, the Behringer is designed the same way as the Alesis; home recording of two sources to feed independent tracks in a recording app. Normally vocal and guitar. Warranty busting again to discover that they use the same A/D chip as Alesis! I know what to do, and one jumper later, we had another case ready for action. We were intrigued by the Mackie DL806, so with a little shoveling into the budget, we purchased one. The Mackie is designed to be a live sound mixer and takes after their VLZ series mixers. It also requires a bit more configuring for your setup. If you are familiar with using a Mackie for broadcasts, you will find it is not much different. Everything gets configured on the iPad, and once configured the hardware will remember the settings. The added bonus, but adds complexity, is each channel has a gate and compressor setting. I am still working out the details of how these settings are saved for different shows and environments, so a more in-depth write-up will follow. Overall it has worked well for us. The culmination of all this is the installation of two Teline Merlin Plus codecs. With these we are now capable of handling up to 12 IP broadcasts. We already had one day which all our stations were out at various times with overlaps. We are now looking into hardening the IP streams. All of this was not all without some humps in the road. I have had a Merlin Plus get into a state where it rejected any connections, yet I was able to connect with the Toolbox and reboot it remotely. My last use of the Mackie had a hiccup where noise poured out of the headphones and monitor on site. This looked to be the dock connection with the iPad or the iPad itself. This is currently under investigation. In another situation the iPad is setup to use either the wireless or the WiFi connection at the venue. Apparently something changed something there making the iPad want to connect to the WiFi, but not passing the stream. The talent was instructed to turn off the WiFi on the iPad. Well, it looks like training on how to use tablets may be necessary. Overall we have been quite happy with our arsenal of remote gear. From traditional codecs to running apps only we have the bases covered. More training and fine tuning is necessary, but in the long run the PDs are happy as are the air talent. Now if I can get my hands on a DL1608 or DL32R…..
One Busy Year and a Happy New Year! Sitting here on the last working day of the year for me and reflecting on the busy year that just occurred and the upcoming year. I hope the economy improves a bit for the radio industry. Though we did good by corporate in terms of being able to clear some much needed projects, the operating side needs a bit of economic help as I suspect many of my peers may agree. Anyways, let’s see what we did this year. Recently Tweeted events was the RCS NexGen installation. Not a huge installation, nor a small one. Let’s say moderate in size at 18 computers and all the fun that goes with installing them. We met our deadlines having all our stations on the system before the end of the year. We will continue to work out the little bugs as they pop up. The most recent bug, as that is the only term I can reference at this moment, is the Export data can only be assigned to a single network. Our audio servers have 2 NICs (Network Interface Card) to keep NexGen traffic separate from other data and external sources. Exported data such as RDS, HD PSD, and streaming must be sent out. We happen to keep our transmitter network separate from house and streaming, and we keep streaming off the house and transmitter networks. While configuring Export data for a station we are lead to believe you fill in the appropriate information and if TCP/IP one types in the port and IP address of the receive machines. Well, this works pretty good for the data we send to the transmitter network (RDS and HD PSD), but not so good with the streaming network. We find that the export data can only feed one NIC. Ouch! Next week we decide if we install a basic router or we press the issue with RCS. Other than little things like this the system appears to be working as advertised. Now if Programming and Traffic departments can play nice. The last accomplishment of the RCS install is we are connected for console control and EAS (Sage ENDEC) control via IP. No GPIO devices are used (for the time being). Now that is cool. We installed a new remote control system. We decided on the Burk ARC Plus system along with various peripherals they provide. I will say the overall project was a success. I will also have to say I may want to rethink some of the work I did. I also must say that 2 ARC Plus units had to be returned for factory repair due to memory corruption of which I updated 3 units to a new firmware version that should take care of this. I am also going to help Nautel and Burk troubleshoot a SNMP error that is occurring with, between, or something the PlusConnect-NV and the Nautel AUI. The PlusConnect-NV talks with the AUI (Advanced User Interface) via IP, so I have no more physical relay closures to the remote control, it is all done via IP. These errors are not causing trouble, but it fills my Burk Event Logs, so it is annoying. Also, no occasion I will receive a false alarm of an NV output power is below lower limit which is most likely due to the error and time-out of the SNMP request. This will be interesting to troubleshoot because it is an area I do not normally get to play: SNMP, Agents and Traps. Another fun time is the network between studio and transmitter sites. All are slow connections in some way or another. Part of two sites depend on the Moseley LanLink which I have noticed is not the most reliable, but works. On the line of Burk and the remote controls, the series of devices help connect many items. One site has the IIU (Integrated Input Unit) and ICRU (Integrated Command Relay Unit), all sites have at least one Plus-X 300 which is an input/metering/relay box, and a site with 2 PlusConnect-NVs and 2 PlusConnect-HZs. The PlusConnect-HZ box connects to the Harris Z10 controller board via a serial connection and then talks to the ARC Plus via IP. Pretty cool on both accounts. In a way you may say that we are nearly all IP connected in some way or another. We ran a firmware update of our SAS 32KD and RioLinks before the RCS installation. We updated all the RioLinks to work via IP. We also added the capability to change show configuration on the Rubicon consoles. If that was not enough, the firmware allows us to add silence sense to outputs. With this I plan to wire some alarm statuses to the remote control for various silence events. Another micro-management and troubleshooting tool. Early in the year we upgraded our old Nortel PBX phone system to a new Avaya. This phone system is capable of using digital phones (which made our transition easier) and VOIP. We will be testing and implementing a bit of this here in the future. We also took advantage of the Avaya and integrated it with our Telos 2101 Hub. Now we have in-house extensions in the studios. We continued to study and test various ways of doing live remote broadcasts. Verizon 4G LTE has been a live saver in some cases and has been a defacto go-to for other broadcasts. In all cases we had at least, if not better, a 98% success rate using this method. We use Tieline Technology codecs and an external 4G router and 4G LTE USB modem. I won’t mention that Tieline has developed an USB module which we plan on testing for them in the near future. Speaking of Tieline we decided to purchase the Report-IT application for iPhones and iPads. We have done a couple of successful long form broadcasts using just an iPad on WiFi. We plan on future testing of the Mic Adapter and Genie. Speaking of iPhones, we are using the iPush to get surf reports to our NexGen system. No more calling in and recording. Audio quality is much better and the reports are seamlessly inserted in the logs along with beds. Lastly I want to mention that my Nautel NV20’s were delivered 12/24/2008. They are 3 years old! As we wrap up this year, I wish my readers a Happy and Prosperous New Year. In a nutshell: Because they work. In the last week we had one day, last Sunday, three live broadcasts or some feed via Tieline. One was our weekly show utilizing a POTS connection, one was an extended broadcast utilizing IP through a resort, and one was feeds from a concert utilizing IP via Verizon 4G modem. Meanwhile a fourth unit was in Mexico ready for a week of morning show broadcasts utilizing IP. Needless to say everything worked just fine with minimal issues. If that was not enough, we helped a fellow broadcaster stay on the air while tower work occurred at their site. We provided our Aux site for use and we used a Tieline to provide audio from their studios to ours via IP. Once again, all worked just fine. If you have not noticed, and you have read the trades, audio delivery via IP is our number one choice. We prepared for and accepted the Internet as a viable option, even international. Latency has not been an issue. Quality is quite acceptable and actually superior. The one caveat is the occasional data hit. This is kept to a minimum with the right combination of data rate and error correction. Of the worst offenders was the resort hotel right in our backyard. Our experience is they have minimal bandwidth shared with many guests. The kicker is the broadcast from Cabo had less errors than the local resort! The ease of use and the flexibility of the Tielines keep us on top of our live broadcasts. We are sticklers on quality. We like to tinker with the latest (4G). We are successful because of it. Our oldest Tieline iMix-3G is coming up to at least 5 or 6 years old now. We work them hard, and we will be working them harder. I am going to attempt weekly updates with detailed posts on those things of interest. As most weeks are pretty mundane, weekly recaps seem to be the best. This week is no exception with the added twist of politics and a day with LTE. The daily grind stuff is like an ATS (automatic transfer switch) service at the transmitter site. I discovered that it was not switching back to commercial power once restored. I sent the model number and pictures to the company that does the service; they send a tech who did not know the model number or device he was to work on until he saw it. He determined it is a bad timing relay, and of course it needs to be ordered. Part two of the service comes when the part comes in. The FUN, yes capitalized, was our day with Verizon (lunch), and the USB LTE (4G to those who like buzz words and terms) device and prototype LTE router. After we got back from lunch we jumped on the test bench and connected our Tieline Field Unit to the router. We ran wirelessly at 192kbps! With 3G we were only capable of 33.6 to 38kbps reliably. Now that is an improvement. The item I noticed right off was the latency when locked in was 60ms! With 3G we saw a wandering latency from 500ms to over 1sec! We saw upload speeds approaching 5Mbps and downloads at 12Mbps. Now I must add that no one is really on the LTE network, but we were impressed. The one thing we did notice as we were testing within the confines of the building that as I moved near the antenna of the device we experienced some data hits. So, the speeds are there, you just need reliable reception to maintain. I bet outside without any interfering factors will make this thing fly real well. With a little tweaking of the pre-correction, I foresee some good times. Tieline: Create a way to connect this device directly to a USB port and you have a winner right now. The political game of business is always fun. I do not take kindly to threats; yet, the third-party company is known to play this way. I kissed and made up with the part that is actually doing the work. It involves and STL move/change. I am wary of the 5dBm margin calculated by Comsearch. If they are a true engineering company this would concern them, too, but I suspect anything that comes under 0dBm of interference passes in their book. I do have the word that the installing party will correct any issues, so we are all playing nice. In our crowded microwave market, and whose isn’t, we try to play as nice as possible. Next week a little trenching and routine work. Soon some Nautel NV modifications (with full reports) and maybe some thoughts on processing. Have a great weekend!